The education of children in the family: It is the dearest wish of the initiators and lecturers. 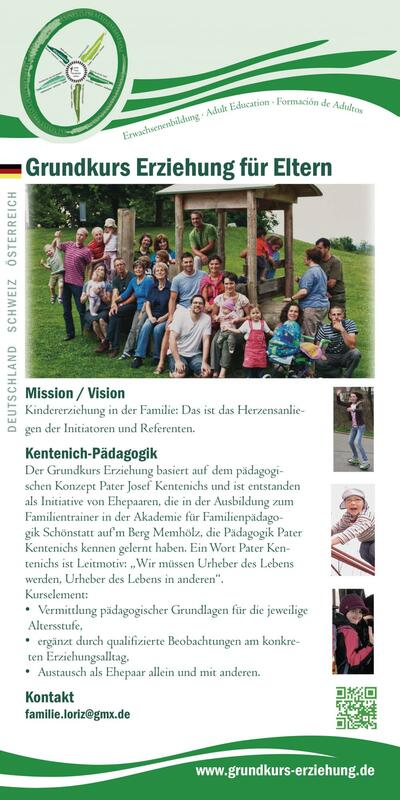 The foundation course in education is based on the pedagogical concept of Fr Joseph Kentenich and started on the initiative of couples who got to know Fr Kentenich‘s pedagogy during their training to become family trainers at the Academy for Family Pedagogy at Schoenstatt auf‘m Berg, Memholz. Their motto is taken from a saying of Fr Kentenich, “We have to be authors of life, the authors of life in others”. discussions as couples and with others.